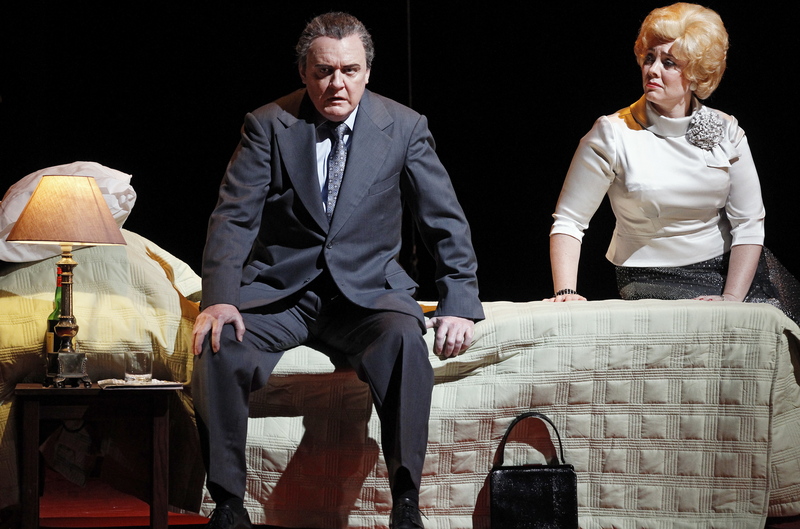 An artistic triumph on every level, La Traviata cements Australia’s position as an international opera destination. There was trepidation in approaching this outdoor spectacle, a fear that overblown “if you build it, they will come” razzmatazz would derail the emotional integrity of this cherished opera classic. Was the popular title chosen for its inbuilt public appeal rather than its musical merits? Would an outdoor stadium leave the audience too disconnected from the stage? And how would they manage the sound? The great news is that the production is clearly a labour of love from all involved, reaching a dizzying pinnacle of artistic collaboration that only opera can achieve. Supremely creative settings, costumes and lighting are matched by the sensational singing, acting and dancing talents of the huge cast. Globetrotting Director Francesca Zambello has done far more than corral the crowds and juggle the technical elements, putting a distinctive spin on the extremely well known opera. Storytelling is paramount, with not a shred of the narrative lost in the expansive setting. A clever touch is the deathbed visuals that accompany the death strains of the overture. Clever use is made of the return of this haunting music in the transition from act two to three as the shellshocked partygoers slowly leave the stage, without the usual benefit of a curtain, and the deathbed reappears. In ensemble scenes, every square metre of the raked stage is used to great effect and even intimate scenes cover the full width of the stage so as to include all of the 3000 onlookers. 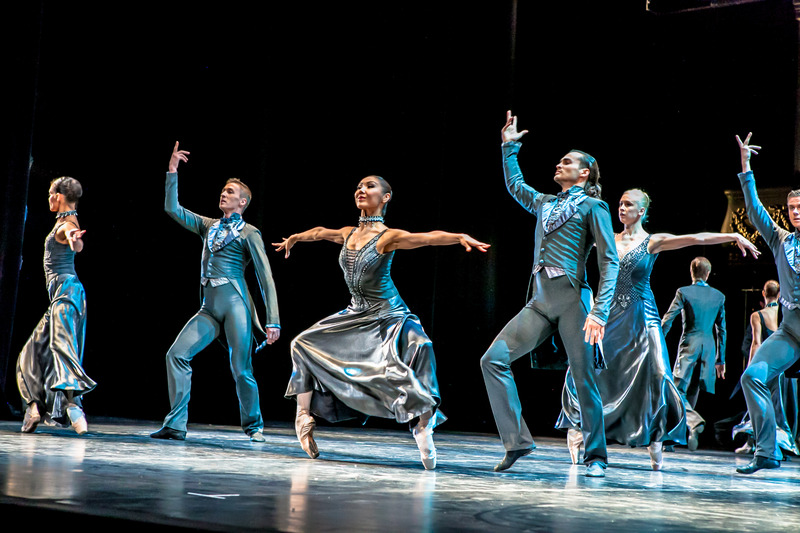 Stephen Baynes’ choreography also takes full advantage of the spacious set, filling Violetta’s salon with elegant waltzing couples and staging a fabulously witty interpretation of the exotic gypsies and camp toreadors at Flora’s. Another design element worth mentioning is the world’s longest couch, which is unveiled at the start of act two with a lounging Alfredo already in position. Six gardeners complete the picture of the change of location from Paris to a once grand country estate. The stage is positioned touching the shore, and the combination of the rake of the stage and the slope of the seating bays creates a solid connect between performers and audience. Greatly aiding this clarity is the pristine lighting design of John Rayment. 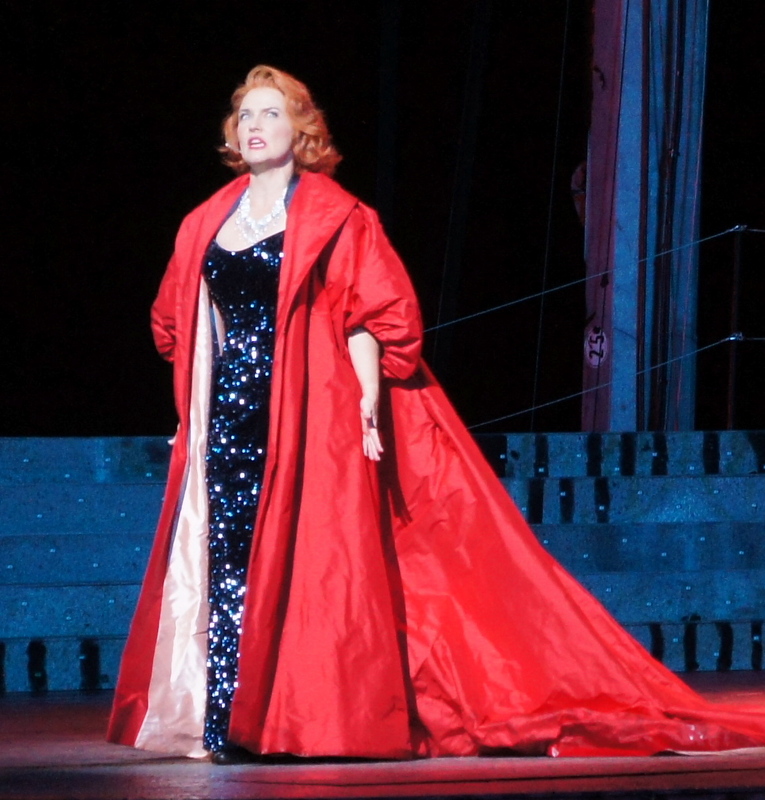 Equally stunning are Tess Schofield’s impossibly glamorous costumes. The 1950s La Dolce Vita-styled setting is a masterstroke of Zambello and the design team, a period of ostentatiously colourful clothing confections but still a time when marriage to a former courtesan would potentially bring shame to an otherwise respectable family. In act one, Violetta in fuchsia and Flora in emerald stand out against against a delectable sea of pastels, none prettier than the row of pale pink jacketed champagne waiters. Alfredo’s glossy charcoal jacket evokes a rat pack era Dean Martin. The disappointment of Violetta’s act two black pant and loose white shirt is forgotten at the sight of her shimmering midnight blue gown and rich red cape for Flora’s party. The palette of shades for the guests, gypsies and toreadors at the party does not sit together as cleanly as the pastels of act one, but extra points for witty use of the suites of cards on the wait staff given that the party features a casino. Brian Castles-Onion conducts the Australian Opera And Ballet Orchestra in a controlled, evenly measured rendition of Verdi’s sumptuous score. Out of sight below the stage, Castles-Onion does not allow so much as one note to slip out of place, communicating with the singers via a large screen above the audience. The final, and perhaps most crucial, design element to be mentioned is Sound. Tony David Gray has done a magnificent job, creating a lush soundscape that is an expertly mixed blend of instruments and voice. Of course it does not sound like opera in an opera house but noone should go along expecting that. 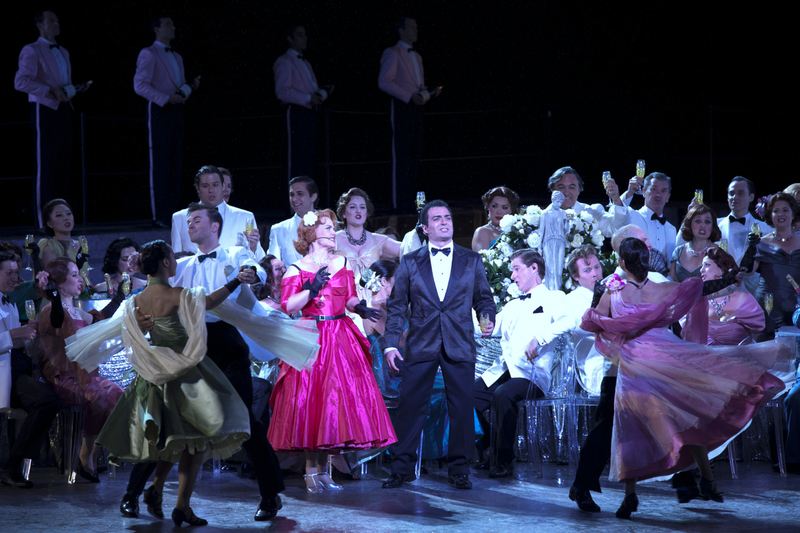 Microphones pick up the full colour of the score from the orchestra and reveal extra detail in the vocals, such as every trill, cough and sob of Violetta’s. This type of quality is usually only achieved in the highly controlled environment of a recording studio. Jonathan Summers, as Alfredo’s father Giorgio, creates a somber, forbidding characterisation with a rigid, upright stature and steely glare. 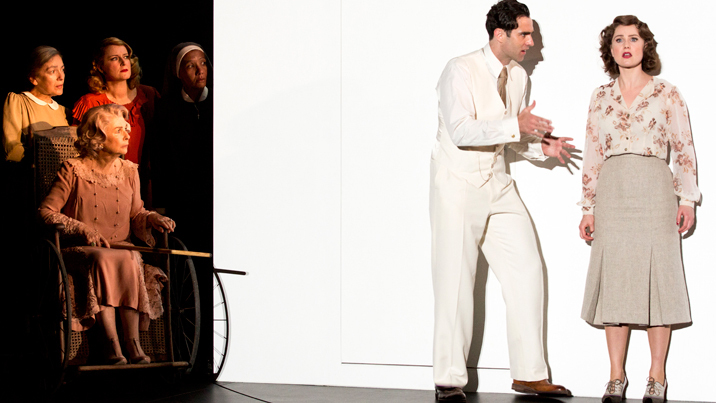 His expressive bass voice in excellent form, Summers makes “Di Provenza il mar” a highlight of act two. Strong support comes from Sarah Sweeting, a tender Annina, and legendary bass John Bolton Wood, the soul of compassion as Doctor Grenvil. Martin Buckingham really makes a feature of the relatively minor role of Gastone and Margaret Plummer is delightful as Violetta’s dear friend Flora. 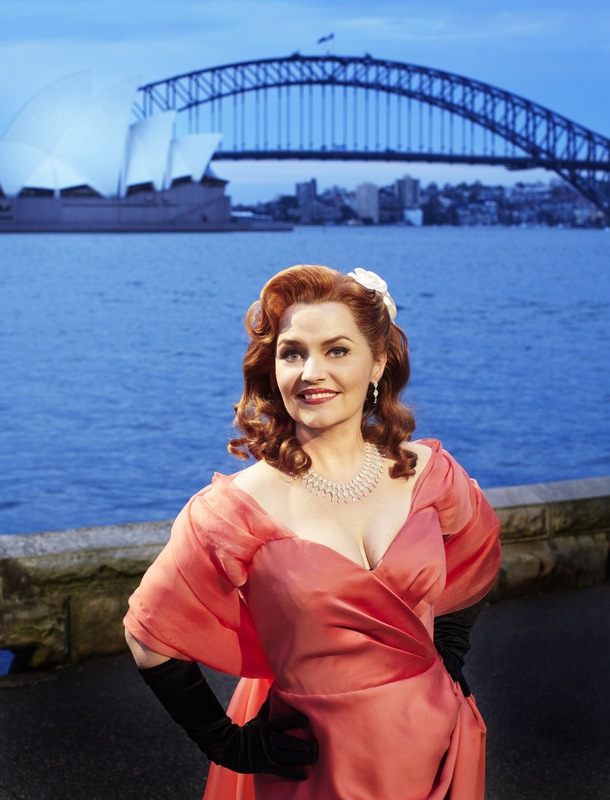 The jewel in the crown, and star attraction above all the technical wizardry, is Australia’s reigning opera sweetheart Emma Matthews in her role debut as Violetta. The performance is an absolute triumph for Matthews, who commands the massive stage and dazzles the crowd with her vocal and acting prowess. 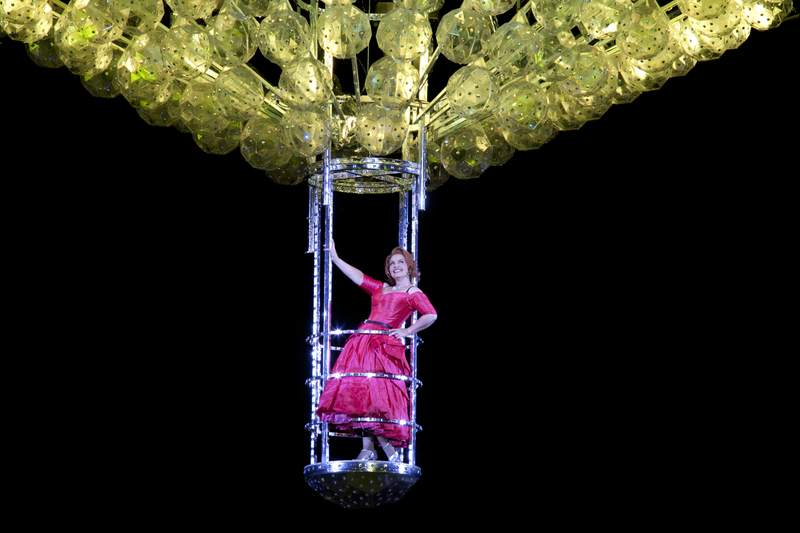 Her incredible high notes and gorgeous expression at the end of “É strano” and “Sempre libera” brought gasps of delight from the crowd, with her ride into the stratosphere in the chandelier possibly also representing Matthews’ rise to even greater heights of superstar status with this performance. With tickets starting from an incredibly reasonable $85, there is no reason any opera or music theatre afficionado should miss La Traviata, and newcomers should prepare to be absolutely blown away. Even better news for those around Australia who cannot make it to Sydney: the program includes an advertisement stating that the production will be screened on Foxtel’s Studio channel on 30 April 2012. See you on the Harbour again next year! This review was posted on Theatre People on 25 March 2012. Thank you so very, very much for your wonderful rewiev! Reading this, it gives the feeling, that we are also there between the lucky ones who could enjoy this magical, unforgettable opera night! Your rewiev about the whole magnificent night is really great, and analysing the fantastic voices of the production is really great! We love so very much reading about our abslutely favorite tenor, the thrilling, exciting Tenor, GianLuca Terranova, we are travelling everywhere, we can, to see and hear his magic Voice and most charismatic, great stage appearance and very expressive acting! Just unforgettable! Once again thanks a million for the great rewiev, we enjoy to read so very much! You are very welcome. It was my pleasure to write this review. I was so inspired by watching the amazing performance. I have to say that I had not heard of GianLuca Terranova before but now I am a big fan. Every time I watch La Traviata I wait for the end of O Mio Rimorso and like I said in my review GianLuca did the best final note I have ever heard! I was absolutely amazed at how good he was. Maybe there is some way you will be able see this production after it is shown on tv in Australia. I really hope it will be on dvd. I hoe you get to see GianLuca in action again soon! Thank you so very much for your precious answer! What a fantastic news, that probably we can see this great opera night on DVD soon!! You`ve made my day with this possibility!! Like you, we are big fans of the thrilling, fantastic tenor, Gianluc Terranova! We just can not get enough from his magnificent voice! He is really THE VOICE OF ITALY! Once again thank you very, very much! Thanks so much for the positive feedback Laven. 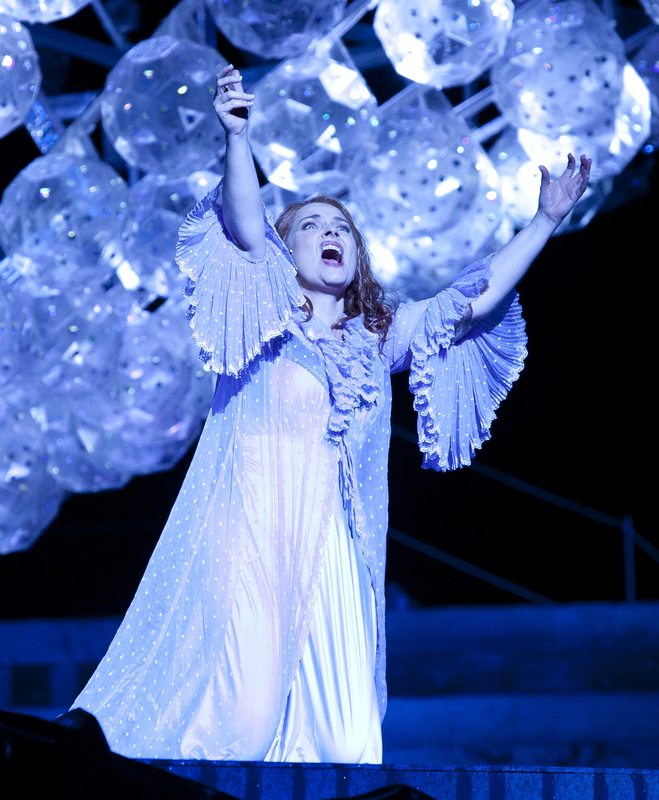 Hope you enjoy the ongoing coverage of Melbourne and Sydney’s operas and musicals!